They have taken part in a patrol mission in the Black Sea. Canadian and Spanish frigates from the Standing NATO Maritime Group Two (SNMG2) arrived in Odesa on 1 April. 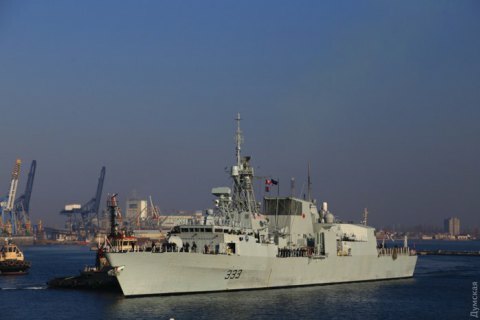 The Royal Canadian Navy's Toronto and the Spanish Navy's Santa Maria frigates moored at one of the berths of the passenger complex of the Odesa sea port, according to UNIAN. They made a port call after patrolling the Black Sea area along with other warships. During their stay in Odesa, the captains of the frigates will meet with the military of the Armed Forces of Ukraine and local authorities, will take part in the PASSEX exercises together with the Ukrainian Navy warships in the Black Sea to improve compatibility with the ships of the Alliance and partner countries. The frigates will stay in the port of Odesa until the evening of 3 April.